Hmmmmm do we have the luck of the Irish this month? Got spring fever yet? As I am typing this, the sun is shining, and the outdoor temperature is in the low 40’s as we prepare for a massive storm stretching most of the US kicking off the month of March. I always see storms as something significant in the spiritual path and something to view within all of us to help our souls growth. There is soooooo much shifting, healing, revealing, and shaking up going on, and I do not anticipate that momentum slowing down any time soon. Forget the Lamb. Hello Lion. Right? Are you feeling this already? Holy cow. Or should I say holy lioness? Or is it the DRAGON masked as the lion? This month, I edge closer to the 50 mark on the solar calendar and this is the time of year I check in deep with myself and where I am going, where do I find joy and what still need to be accomplished. Over the next couple months, I will be doing LOTS of traveling for personal and professional development to attend a magical wedding, co-facilitate a men’s healing group in VT, and attend the Trauma Training Conference with Vander Kolk. Just to give a glimpse. This month I feel will definitely push boundaries and push us out of our comfort zones forcing us to dig deeper before the thaw and emergence of the new plantings of spring. Last week I wrote about an experience I had at the park with hearts on the 10 year anniversary of the divine sending me signs and learning to build a partnership with the divine to help guide me on my path. You can read the post here, Self Love – A Journey With The Divine in Nature. I write these posts from the heart to share these journeys with you. As always, I would cherish your comments and feedback on the post and know if what I write resonates with you and helps guide you on YOUR path. Many of you have been hearing me talk about dragon energy increasingly over the last few years and may have even attended an event I facilitated where we tapped into dragon energy. Well check this out… this is filed under #cantmakethisshitup. 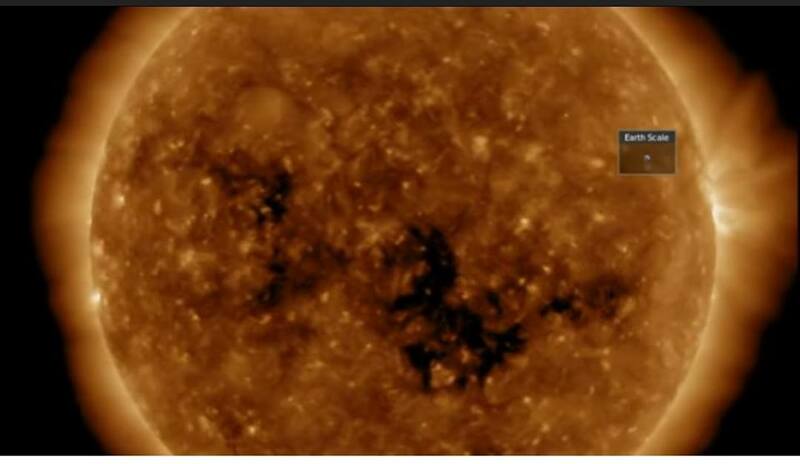 I was watching a scientific video on the updates of solar activity and how it affects the sun dated 2/27, and while watching it, I saw a dragon in the coronal hole of the sun (or what I like to call the shadow side of the sun). Do you see it? Here is the screenshot I took. I believe this is the same solar storm that spewed out a dragon northern light show that was circulating all over social media on the 28th. So now we are in March … how lion … I feel like our the wounded unhealed part of our egos might get quite the challenge this month and it is important to remember to come from a place of soul and view what surfaces emotionally for you as a road map of what needs to be released, healed, or reevaluated. With mercury going retrograde on March 6th, it will be a good time to re-evaluate, relax, rethink, redo, plan, prepare projects or situations. Now I am a Pisces, so what I know is that it is important to PAUSE and seek the lessons or pearl of wisdom that is being presented to you. You might find this challenging because we are a culture and a society that let’s our emotions control us vs guide us. Yes there is a difference. understanding love, unconditional love, and self love on a deeper cosmic level. like the dragon, muster up the courage to take a leap of faith in the direction that has been beckoning your soul. Time to face our inner demons, heal old wounds, and purge old belief systems so new and more soulful beliefs can be birthed. Dig deep and get real with yourself and continue to go into the shadows of self and confront your fears. This is where the buried treasure resides. © 2019 Laura Joseph. All Rights Reserved. This information is for general educational uses only. It may not apply to you and your specific medical needs. This information should not be used in place of a visit, call, consultation with or the advice of your physician or health care professional. Communicate promptly with your physician or other health care professional with any health-related questions or concerns. This article does not share the opinions of Healing With Spirit or its affiliates. Be sure to follow specific instructions given to you by your physician or health care professional. Since 2016 began, we have been pushed to extremes, prodded, and forced to examine our inner selves and workings. What I see is that we’re being forced to address the idea of attachments and the art of learning to detach. We build attachments as human beings to people, places, and things. Our human ego builds emotional attachments and feeds on them. The big struggle I am seeing with many of us right now as we adjust to all the downloads and cosmic upgrades, is learning to let go of those attachments and trust in the process. This doesn’t mean that you stop caring or stop doing certain things. It simply means removing the emotional attachments. The art of learning to detach oneself from people, places, and things, has proven to be a undaunting task for sure as we begin to question everything and everyone in our lives. We even begin to question our very existence and path. Are you experiencing this yourself? I’d like know, and I’m sure others would too. We have been shown how strong the will of ego can play on our mind, body, and spirit and wreak havoc in the process hindering progress of our soul growth. But really, is it hindering the process or is all of this part of the evolution of our soul? Once the illusions are peeled away, our truth is revealed. How scary it is when driving blind in the darkness, but how liberating it can be when you can see the light again from a different view? Just like we wake up every morning, we brush our teeth everyday. We eat everyday to fuel our body, mind and spirit. Our body eliminates waste every day removing toxins that no longer serve us. We must also exercise the art of letting go and detaching from those situations, people, places, and things that are holding us back from our spiritual path and soul growth. We are a part of a larger consciousness. As a society, many feel we can control anything and everything. However, in reality that is ego creating a false sense of reality. When we choose to decide to let go of control, partner with source energy, you just might find everything else in your life improves … home life, relationships, work, etc. Why do we expend so much energy into holding onto attachments that no longer serve are highest self? It is a question I have been asking myself repeatedly over the last month. Is it because we know we have a lot of toxic waste to dump, and just like Mother Earth using floods, hurricanes, and other storms to clean house, sometimes it gets a little too mucky and dirty for us face? This is despite the fact, we know at the end of every storm, you reach the pristine soil ripe for planting those seeds you wish to flourish. You cannot plant heirloom flowers in toxic soil. We must clean it up and start amending it to get what we do want. As a result, many of us are experiencing huge purges especially of old emotional traumas and pain. If you are part of society resisting this, I pray for you. You are the group experiencing the most pain right now. Law of attraction teaches us that resistance is futile and as above, so below. I know I personally have had my symptoms heighten or worsen include: sleep disturbances, PTSD triggers, heightened anxiety, voice issues, ringing in the ear, lung and breathing issues, vocal cord issues, fatigue, lack of appetite, and increased thirst. So you see you are not alone. We are all one. We are each other’s brothers and sisters. As I was doing my meditative walk this morning thinking about this topic of detachment and my journey this year so far. I stumbled upon first a cardinal feather followed by a turkey feather. Both feathers are also signs from my spirit team, angels, and source energy aka soul that we are on the right track. Again, another confirmation. It’s a message to help us stay focused on the path that we are trying to create and have faith that all good things are coming to us. What do I do to stay on the path without losing my mind? I practice the art of appreciation, gratitude, and forgiveness every day. I meditate and practice Reiki every day. I have a set of affirmations posted on sticky notes on my bathroom mirror that I cite every day. I have healthy relationships with my core friends who support me and are there for me without criticism or judgements. Many of us have toxic family members and friends. How is that working out for you? I do my best to avoid processed and non GMO foods. I get into nature and ground. Remember, it’s always darkest before dawn. Bad times never last. So focus on memories of previous good times you have had to help you through the bad times. Your Soul Is Trying To Awaken. Are You Listening To The Signs? Wow what a September it has been. Talk about a roller coaster ride. Our soul has been tugging on us to wake up. Have you been feeling this? I have been noticing for some there have been major breakthroughs and a sigh of relief. For others, the challenges just seem to be piling on. If you are like me and have been talking to others in the Spiritual community or even in healthcare especially psychotherapy, the synchronicities have been amplified like we have never seen before in this lifetime. There are common themes I have been noticing. We are not alone. We are all one and connected energetically as one. Many of us already knew this, but it seems to be really drilled home. Many people are reporting similar chaotic experiences occurring at the same time. Those who are experiencing challenges especially involving a parent/child relationship, have been greatly tested. Those who are resistant … deliberately, not deliberately or even subconsciously … to the current cosmic shifts and calls from the soul are experiencing heightened health issues such as insomnia, anxiety, panic, heart issues, digestive issues, moodiness and more. For those feeling frustrated, anxious, or having sleep difficulties etc … There are a couple of things that could be happening. Here are some tips to help you sort out. Ask yourself what is it that you are still resistant to change? If you are resisting what your soul is beckoning from you why? Let go and trust your soul has got your back. We are being called to align with soul. For those who have been following me, have been hearing me say “Trust, your soul has got your back” for quite some time now. And our soul and Spirit have been bombarding us with signs to help us along the way. Have been experiencing such phenomena? Here is my experience just the past few weeks and I am amazed at Spirit every time. We are always receiving messages from heaven. It’s just whether or not we choose to see the signs from our soul, our loved ones, guides, and angels. For me personally, I have been hit with lots of “signs” from Spirit and soul. Walking to the car, home, in nature, or the like and a feather is somehow beneath my feet. This happening once? Ok, but happening sometimes as much as ten times in one day? That is something one can not ignore. I must preface to say that if you are going and deliberately seeking to find signs, you may not get them. In every one of my experiences, the signs have fallen upon me without seeking like a detective. They just happened. Certain wildlife interactions as if they have something to say. These are not the normal run ins, but ones that either suddenly repeat occurrences, are profound in how these interactions occurred, and usually occur in themes such as you are upset at something, or worried about something, having relationship difficulties, unsure of where you are going in life etc. Signs through the elements – Spirit can alter the elements such as water in the clouds or fire to reveal what they want you to know. I have been receiving signs for years, but the last 30 days have been extraordinary. Signs such as hearts or pennies. Again, if like me and they are happening numerous times in one day, then you need to stop and really pay attention and listen. Signs? Everywhere there are signs? Here are some signs I have been guided to share with you that I have personally experienced over the last 30 days. On this day, I was walking to my car and just happened to look up at the clouds to see several signs. These cloud pictures were taken on the same day at the same location. It was like a spirit mural of messages. The swooping heart downward was the first that caught my eye yet the last in the messages. Then when I glance over I saw the Angel with a cardinal beneath her holding a ball of white light. Can you see the image in the picture to the right? The feelings of peace instantly filled me up as I was having a challenging week. These are the words not spoken but clearly understood, and grateful. A smile instantly over came me and my worries instantly dissipated that day. However, it was not until I decided to clean out my photos a few days later that some very striking images appeared that I did not see before. There are two that I am posting here. The first photograph is to the left … The Spirit Messenger Bird. Every time I look at this photo, I just want to go WOW. I am in complete awe at the size of this image and the clarity of the details. The photo can not give you the sense of scale, size, or emotion as it was quite large in the sky. I’m almost speechless. When I saw this bird in the clouds, it did bring me a tear of joy. Things are changing my friends. The second image I took several weeks ago. Do you see the image? This particular image was not revealed to me until few weeks after it was taken. I was sitting at around this fire pit while on Cape Cod and felt a spiritual presence around with a very transformative message for someone who was with me that evening. I was also guided to snap a few pics. The message I channeled that was helpful and healing to that person and something this person needed to hear to heal karmic ties with multiple past lives. I am also grateful for when Spirit materializes or gives us signs such as this to confirm those messages and prove the continuity of life. This message was both for me and the other party. The image was to validate the experience we both shared in healing the past and knowing we are divinely protected at all times. This month’s energies have been quite challenging to say the least, but I am still smiling. I’m still grateful. I’m still filled with peace in my heart. When we come from a place of gratitude instead of fear, the challenges we are faced are met with clearer and swifter solutions. We are shedding off the old to reveal the new. We are in this together. Together we can choose to enjoy this ride called life. It is important to try to embrace these energies with welcome arms even in times of adversity. Let go resistance, and trust your soul has got your back. We are all going through great transformations. What signs from heaven have you been getting? I’d love to hear. After every great storm, the Sun returns to shine. After every great storm comes the rainbow. After every big storm and rough surf comes fertile soil. With every big storm comes nature’s pruning of unnecessary branches and debris. After every big storm comes green grasses. After every big storm comes beautiful big flowers. After every big storm comes the birds, the animals, and the emergence of life awakens. The cycles in our life are no different than the cycles of nature. When we experience stormy weather things seemed unclear, cloudy, and at times destructive. It is during those times, we sometimes are unable to see the Sun behind the clouds or the rainbow in the sky or the new sprouts of plants preparing to emerge from the soil. And as human beings we experience similar stormy weather such as rip tides, floods, hurricanes and devastation. However, it is during those times just like in nature, that we are clearing out the old, the sick, and the energies that is clogging up our abilities for the new to emerge into our life. During this mercury retrograde, learn to enjoy the storm. Sit back and enjoy the ride. For once, it is time to get out of your own way and let the Universe lead the way to your higher calling. The last 30 days have been quite the ride. Can you relate? There were lots of storms – literal, physical, emotional and spiritual. 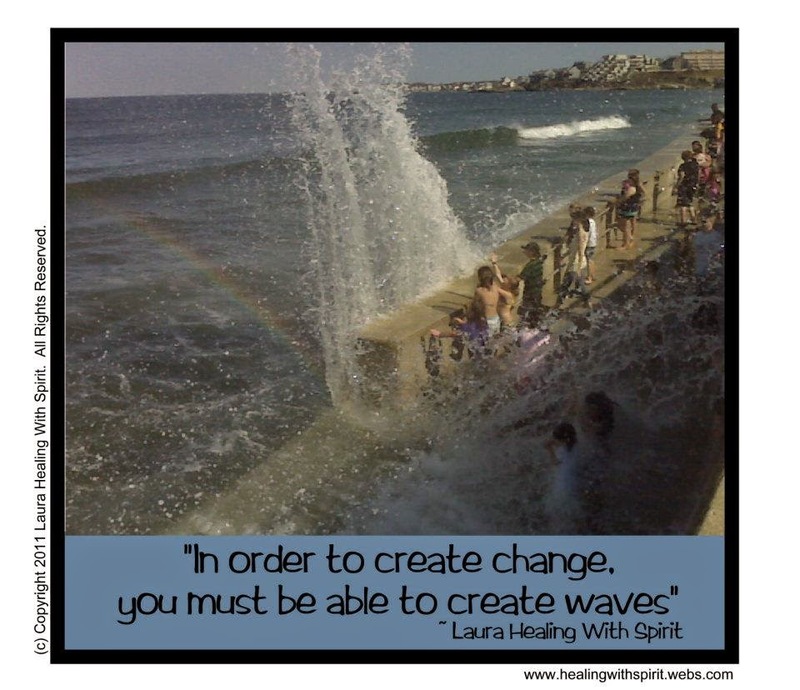 October was a very powerful month for transformation and setting the course for the future. Some of us had clear skies and smooth sailing. Others of us may have felt they were in the midst of their own hurricane. The Universe has been pushing us to learn what we came here to do to fulfill our soulful purpose. For those who are struggling and resisting to this change, may have felt the impacts of these storms. However, those who have learned the art of surrender, may have felt a huge quantum shift and a lift off their beings. We have been working really hard for the last several years to get to this point. It has been a few days since Mercury went direct. It is time to let the games begin. How has this past retrograde affected you? Have you felt a shift since Saturday? One thing to remember is what happens after a good storm. We see life returning, the rainbow and the return of the sun. The storm has past. The sun is shining. A lot of amazing things are about to happen. Do you feel it? Here is a message from spirit from a couple days ago that I feel is still relevant for today. Copyright 2014 Laura Joseph, Healing With Spirit. All Rights Reserved.